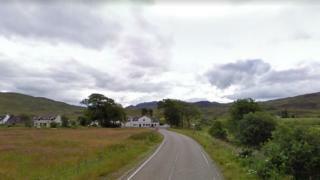 A driver has died after a one-vehicle crash on the A890 at Strathcarron in Wester Ross. Police said the collision, involving a grey Audi A3 saloon car, happened near the Strathcarron Hotel at about 19:20. The 42-year-old driver died at the scene. The road was closed for several hours as crash investigations were carried out. Officers appealed for anyone who witnessed the incident to contact them.